I went out to the Hudson River Park the other day with some friends, and it was that most unusual (for New York) of occurrences: a beautiful August day. I'm not really a big fan of summer—the HEAT!—but on an 85 degree day, watching people sunbathe and enjoy the breeze coming off the Hudson, I could see the appeal. 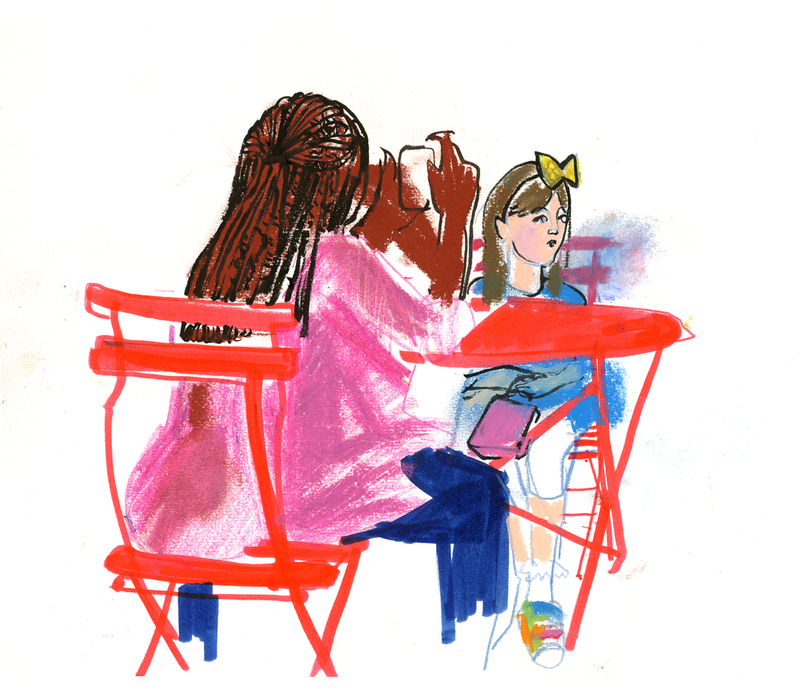 Here's a drawing I did when I went to see Macy's Flower Show with Siyeon on Monday. I was so excited to finally see some flowers. It's *almost* like spring is really here! Almost. After I got home, I organized my thoughts a bit more and did one with perhaps less detail, but more coherence. And here's the thumbnail I created way back before I went. In my head, it was more about giant flowers, and less about all the black makeup kiosks and shiny surfaces. Such is life. I went out with Evan and Siyeon to draw the St. Patrick's Day parade on Tuesday. Here in New York, we have a very robust celebration, with a big parade and a lot of onlookers cheering it on. It's always fun to draw all those bagpipers in their plaids. Looking down Fifth Avenue, it just looked a like a giant crowd advancing with giant flags waving, which I guess is what it was. Having to blow on those bagpipes for so many blocks must be pretty intense. We were all the way uptown by the end of the parade. I can only imagine from this guy's face how tired he was of blowing on those pipes! These three were directly across from me. They must have been early in the parade and then stood by the finish to watch all their compatriots with obvious enjoyment and pride. I felt like they had such Irish faces, and in their dress blues, they were such an Irish-American New York story all by themselves. St. Patrick's brought to mind some work I recently saw at the AFA Gallery in Scranton, PA where my teacher Veronica Lawlor currently has a show. Kevin McCloskey, one of the other artists featured in the show, created a series of prints about the lesser known miracles of St. Patrick. To me, their humor and storytelling embody defining traits of the Irish character. If you're in Scranton, stop by the gallery. Definitely also check out Ronnie's reportage of the parade as well. This week, the temperatures actually breached the 50 degree mark in New York. We haven't had the weather that Boston has had, but we've had a lot of cold, cold days here. So perhaps I was overly optimistic when I headed out to Central Park. I was hoping for something—anything—in bloom, but of course, the park was all bare branches and snow still melting everywhere. Sigh. So here's Bethesda Fountain in the middle of Central Park, bare branches and all. I spent the holiday on Cape Cod and had a chance to get outside and do a little drawing since the weather was so mild. There's a nature preserve nearby, with some paths that are well-traveled by the locals. There are also some beautiful views of the water. And of course, the sun was setting! Here's to more and better in the new year! A couple of weeks ago, I went to draw the ice skaters on the Rockefeller Center rink in the middle of the Christmas swing. I thought I should post it before New Year's officially puts an end to the holiday season! I started the day a little after 2 at Washington Square Park. The crowd was so massive, it was hard to get any distance on it. I was at the park until 3 or so, and people were still streaming up Fifth Avenue even though the march had started an hour ago. As people marched around and through the triumphal arch, I wanted to make sure I included the statue of George Washington that stands against the north side of the arch. More on him, later, though. At Union Square, the festive red and white striped booths of the holiday market made an incongruous backdrop to the protest. I'm not sure what the shopping tourists made of the protest, but I saw plenty of onlookers taking photos. The march took place on the same day as SantaCon, and I saw at least one Santa taking part. There were a *lot* of cops lining the route of the march. These three were pretty jolly considering the chants marchers were directing their way. I guess I'd rather they be indulgent than aggressive, but their confident, even arrogant, body language said it all. The march ended near Foley Square in front of police headquarters. The police had set up a dead end, so everyone was packed into a really tiny space. There was a constant stream of people moving in and out of the plaza as people were deciding to go home, to stay and protest some more, or to march to the Brooklyn Bridge. At the bottom of the page there is a quote from George Washington inscribed on the pediment of the New York State Supreme Court Building in Foley Square, which I saw as I was leaving the march: "The true administration of justice is the firmest pillar of good government." To me, it was a perfect summary of the point of the march, and since I'd started with a drawing of George Washington, it seemed apt to end with him as well. If you want to see more reportage of the march, check out my friend Alex Charner's powerful work on his blog. I went out to Foley Square last night with Carly Larsson, Evan Turk, and Chris Brody to reportage the protest surrounding the decision not to indict the police officer responsible for the death of Eric Garner. The first thing I noticed was how many people came out. I've seen estimates in the thousands, and that's just at Foley Square (here's a photo from above from Gothamist). It was heartening to see so many New Yorkers come out to protest, and I was especially glad to see how diverse the crowd was. Especially at the beginning of the protest, many of the protesters were very young, possibly college or even high school students. Unlike the Occupy protest, some people had amplification, although to communicate with the whole crowd, the human microphone was in full effect. The protest moved down to the entrance to the Brooklyn Bridge (which is only a few blocks from Foley Square). Since I was hanging back a bit from the main protest group to draw, the cops formed their line right in front of me. They made an intimidating barrier. Their commanding officer was telling them "shoulder to shoulder!" as they lined up. Since the protesters were denied access to the bridge, they started marching back to Foley Square. A lot of people carried signs saying "Black lives matter" and "End police brutality," but I found these paper cutouts really haunting. Each one had the name of a black man killed by the police: Sean Bell, Mike Brown, and Eric Garner, among others. The protest left Foley Square so quickly, I actually lost them for a bit. I found them again down on Canal Street, at the entrance to the Holland Tunnel. The protesters had moved to try to block the tunnel, but again had been turned back by the police. If I was intimidated by the uniforms and the numbers at Foley Square, it's nothing compared to how I felt seeing riot helmets and batons. After that, the protest moved on without me. I went down there feeling pretty down about the state of our democracy, but going home I felt buoyed by the turnout of so many people who care about what goes on. I don't know if there are more protests planned, but if you're upset, even just a little, by police brutality and the lack of accountability, I encourage you to go and see or participate. Well, it looks like fall is really over. Last weekend was chilly, but still warm enough that I could sit in the Brooklyn Botanic Garden with Carly Larsson for half an hour and make a couple of drawings. Today, it's 28° and I won't be sitting outside for *any* length of time if I can help it! 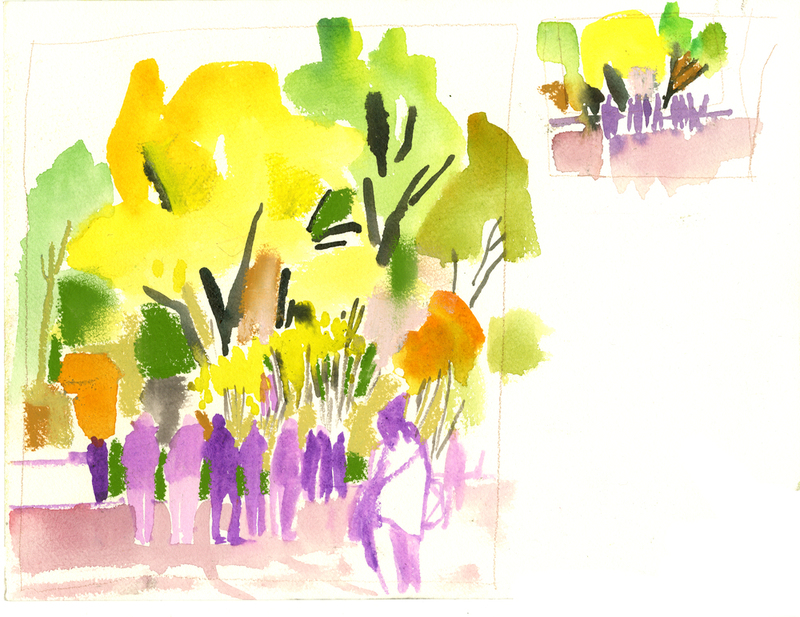 A few weeks ago I went out to draw in Central Park with Carly Larsson (who is much faster to post than I am!). The weather was perfect for sitting outside and getting chilled, and then going to get a cozy tea. Incidentally, this is my 100th blog post! Yay! When I started 100 posts ago, I found it really hard to share my work. I can't say that I never look at my work and say "Ugh, who could like this" anymore, but I definitely think it less often because people *do* come by and tell me they've liked this or that post. So thanks for following or stopping by, and thanks for your comments and encouragement. I sat down and made this drawing back in August. The garden where I pick up my CSA veggies was all abloom. I was having fun with marks and thinking how nice it would be if I had a person to draw in there, when in wandered this rose-lover with his camera! Some things you just can't plan. I went to the Halloween Dog Parade in the Tompkins Square Park Dog Run yesterday to check out all the adorable dogs in costumes. I should have guessed when I saw that they've been doing it for 24 (!) years that it would be crazy, but I was completely overwhelmed by the crush of people and dogs. Of course, since it's New York City, most of the dogs were pretty small. There were many, many chihuahuas. There was only one little ram, but he was so cute, I drew him from a few different angles, until Mr. Bumblebee there got in the way. I loved this dog's costume because it was so understated. The guy clearly had to go out and buy some dog shoes, but the rest of it was just kids clothes and beats headphones. And he looked great! Again, this golden retriever's costume was simple, but made great use of a transparent cone. Bonus points for involving booze. Disney princesses and Pixar characters were popular. Of course, superheroes are perennial favorites. These two were having some kind of conversation. Wonder Woman, from the back, and taking a load off. A few miscellaneous ones. What is this first one? A handsome fellow with a leather jacket and a white scarf. Anyone out there have any ideas? A lot of people dressed up with their dogs, and this seemed to be one way to get into the honorable mentions or to show or place. The other way was to build a whole set for your dog(s). Gomez and Morticia Addams were there, with Thing perched on Gomez's shoulder. You could barely see their dog under his long wig and hat because he was Cousin It. This Princess Leia and Jedi had built a whole Ewok village for their little Ewok. Another dog you could barely see under her costume: a blue dress and blonde wig. The give away were the dragons perched on her (and the big dragon carrying her). Khaleesi! There was another Khaleesi there with Khal Drogo, carried by one of his bloodriders. Unfortunately, I couldn't get around to the other side, so you only get the bloodrider holding his little Khal Drogo. This one was the runner up, and I have to say, I thought it was one of the best. Full makeup, props, and a lot of skulls. The winner was the Titanic complete with, well, the Titanic! Three dogs dressed to the nines pushed by a very proud captain. I had my personal favorites, though. I think Barking Bad was pretty genius. The big dog was the RV and the little dog was Walter White. Their human was dressed in the yellow hoodie, so I guess he was Jesse Pinkman. This couple went all out also. They were dressed as mushrooms and were carting their little caterpillar around in a little garden. When it came time for their presentation to the judges, the caterpillar transformed into a butterfly! And there was even a sneaky cat (!!) disguised as, guess what? A dog! And, last but in no way least, a little Yorkie chia pet. The owner told me that his wife and her mother had made the costume themselves. I love a DIY costume! If you can't get enough dogs in costume, go check out my friend Carly Larsson's hilarious blogpost on the Fort Greene Great PUPkin Dog Costume Contest. "From the archive" sounds better than "from that giant pile of old drawings," right? I found this drawing in the same...archive (wink wink, nudge nudge)...as last week's. I had sat down in Epcot's Japan pavilion in a drizzle with Veronica Lawlor and Margaret Hurst. At first it was just us, and I reconciled myself to a quiet drawing of pine trees and the pagoda. As the rain slowed and finally stopped, everyone popped out of their hiding places and I had a much more fun, chaotic drawing of people doing all the things they do (including using stools as a drum set).